Your little girl will be ready for heroic adventures wearing this Merida-inspired adventure costume dress from Little Adventures. 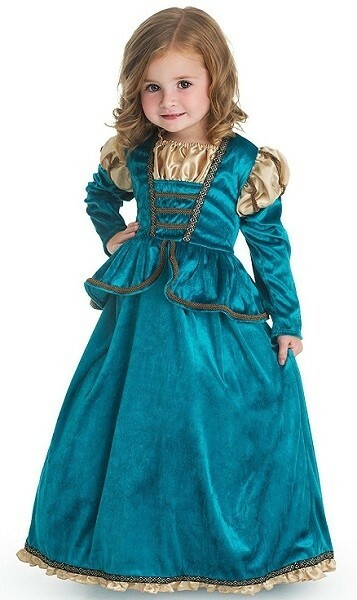 This dress is made of comfortable, soft velvet with fully finished hems and seams, so she doesn't catch her her fingers as she's putting it on. Gold trim accents the deep teal fabric. All she needs is her trusty bow and arrow, and she'll be ready to ride off into the forest, bound for discovery! For more Merida-related items, visit A Mighty Girl's Merida Collection. To browse our entire collection of girl-empowering costumes and dress-up clothes, visit our Costume Collection.